If you lived in St. Louis during the late 1990s, it is difficult to capture the hysteria that surrounded Mark McGwire after his trade from the Oakland Athletics at the 1997 trade deadline. In just 51 games as a Cardinal that year, McGwire managed to hit 24 home runs, a precursor to the home run record he would set the following year at 70 and the 65 to come the year after. I was too young at the time to appreciate the ominous impending cloud of the steroid and performance-enhancing drug scandal, though my sense of the era was that hometown fans overlooked any speculation about steroid use concerning the players on their team but were quick to accuse the sluggers on rival teams. And back then, no one could change a game faster than McGwire. I have a strong memory of people asking the question “Did McGwire hit a home run today?” even before inquiring as to whether the Cardinals won that day’s game. It was a question that had a fair chance of being answered in the affirmative, as McGwire hit a homer in over 40% of the games in his magical ‘98 season. Culturally, the Steroid Era of Baseball coincided with the tail end of the baseball card boom in which sports memorabilia, and in particular baseball memorabilia, was experiencing a final revival before a fifty-year trend came to an end. My two souvenirs from the era came in the form of a 1985 Topps Mark McGwire Topps Rookie Card and the 1987 Donruss Rookie Card. This was not a textbook case of buying low–I probably spent about $75 in allowance money on these two acquisitions. If you study the pricing history of these McGwire rookie cards, it really is a microcosm of the stock market at large as the collector community’s attitudes towards McGwire cards ebbed and flowed in a pattern that mimics the irrational optimism and pessimism that you find with stocks, bonds, and anything else humans trade as well. During the 1998-2000 stretch, the ‘85 Olympic McGwire card hit a peak value of $78 and the 1987 Donruss McGwire Rookie Card hit a peak value of $92 (the reason why there were two McGwire rookie cards issued in different years is because Topps issued a special-edition card run of the 1984 Olympic team, and the Olympics required amateur athletes at the time to field teams, whereas the 1987 Donruss McGwire card was consistent with his Major League Debut in which he played a few professional games with the Oakland Athletics in 1986 and enjoyed his first full season in 1987). You should note that I am discussing the market for the cards in ordinary condition–the mint market has always had crazy pricing in the thousands of dollars. By 2004, the value of these cards came down to $16 for the Topps ‘85 McGwire and $14 for the ‘87 Donruss. During the low point in the 2009 recession–turns out, when times get tight, people don’t gobble up baseball cards–the Topps card saw its value fall to $3 and the ‘87 Donruss traded for $4.50. Since then, there has been a real bifurcation in the value of baseball cards based on the quality of the card itself. Baseball card snobbery has gone through three phases: (1) in the 1970s and 1980s, cards that were determined to be of value were those that were of Hall of Fame ballplayers; (2) in the 1990s, the focus shifted in favor of treasuring “Rookie Cards” of a player’s first year in baseball, as those were the most limited edition sets that were issued and were therefore the most rare; plus there is little reason to distinguish in value between a player’s 3rd, 4th, or 5th year in the big leagues, and (3) since the 2000s, the focus has shifted to the quality of the rookie cards of Hall-of-Fame type players in which people get their cards graded and put in a case. If a corner of a card gets bent or dirty, the value of the card is nearly annihilated. 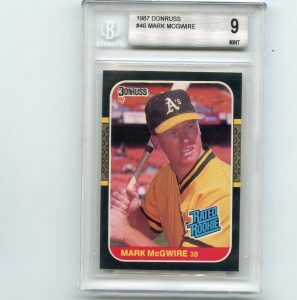 Now, a perusal of Ebay indicates that these McGwire cards have a wide range of value depending upon the quality of the card, plus there are some opportunistic sellers who are hoping that the nostalgia that lingers surrounding these two well-known baseball cards will trip someone up into paying a value much higher than it is worth. Some of the ‘85 McGwire Topps cards are going for prices as high as $5,000, with most of the mint condition cards settling in a range of $125 to $275. If you are indifferent as to quality of the card and can tolerate a bend or scuffle, you can acquire it for $1-$5. The ‘87 Donruss version of the McGwire Rookie Card has settled into a much cheaper price range, with most of the cards selling for $5-$20 largely irrespective of card quality. For me, this is largely an academic conversation. Within a few months of buying the McGwire rookie cards, I traded them both to my friend Will for a generic Ozzie Guillen card that he told me was worth $100. There no cell-phones with internet access then that would enable you to take a quick glimpse of the going rate, and I learned later upon an examination of a beckett (think magazine equivalent to the back pages of Barron’s that print stock quotes) that the Guillen card was worth thirty-five cents. After I squawked about it the next time I visited Will, his mom offered to undo the trade but my dad refused because he thought it was important that I learn the lesson of verifying information before giving your word to a deal and the fact that oral contracts shouldn’t be undone just because you have to give more than you take. It turned out to be cheap tuition to the school of Common Sense and Integrity. It has also informed my analysis of other investments and explains why most financial discussions on my site focus on cash-generating assets. If you own a property and collect $10,000 per year in rents from it, you are receiving independent value from that transaction without needing any assistance from a third party. You can sit there and collect $10,000 year after year without needing to find any acquirer in the market. If you buy gold, autographs, baseball cards, or art, you need to find someone out there willing to pay more than you did for it in order to realize value. There is no independent value gained by holding other than the expectancy that the passage of time will increase scarcity and induce that third party into paying more. I maintain a healthy appreciation for how much sports and related activities give you lessons of general applicability to life. Those McGwire rookie cards have been a mini stock-market, rising and falling dramatically in value over the past two decades. 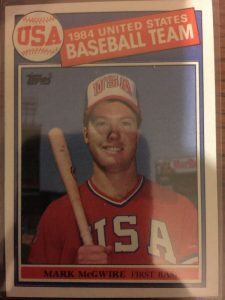 There is a lesson about the pain of owning an asset that generates no value, as the only way you can monetize a 1985 Topps Olympic McGwire Rookie Card is by keeping it in case and away from human activity with the hopes of getting a few hundred bucks out of it in the end. If you store it in a safety deposit box, your pro-rata portion of the storage costs would eat up a large chunk of any eventual profit. In my case, my adolescent decisions after getting the two McGwire rookie cards came with the added touch of a life lesson. Back then, I spent the equivalent of two months’ allowance on those two cards and I all I had to show for it was an Ozzie Guillen card that was only worth three bites out of a McDouble. I actually carried that Guillen card around in my wallet through college to remind me of the importance of verifying information before engaging in any bargains. When I evaluate and reflect upon the wisdom I picked up as a result of that trade, it’s hard to say I didn’t get more than full value from those McGwire rookie cards I bought a dozen and half summers ago.